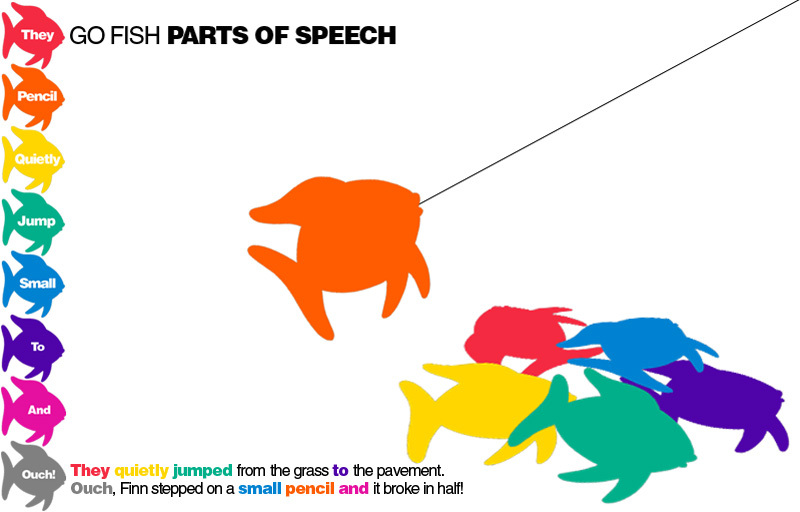 Write down different words for each part of speech on bright colored paper fish. Then, flip the fish over so the word isn't visible. Mix them up in a pile. Kids have to catch eight fish. They have to find words that represent each part of speech. For younger kids, you could simply do nouns, verbs, and adjectives. After they have found each part of speech, they use their words to write a sentence or two. Note: Mix up the colors. For example, don't write all the verbs on green. Otherwise, the game will be too simple and kids will look for colors instead of recognizing the parts of speech. How to: Cover your paper fish in contact paper. You can find the above fish template here. Next, attach a magnet to the fish on the same side as the word. You can buy magnet strip rolls at Staples. Find a stick outside, attach a long piece of string, and add a round magnet around the end of the string. Now, go fish!